Lentil soup may have been one of the first things I learned to cook. No, this wasn’t even that long ago — I haven’t been cooking my entire life. It was back in college, when I didn’t really know what I was doing in the kitchen and I definitely needed a recipe for everything I made. My roommate had a copy of the Moosewood Cookbook, that vegetarian bible with its illustrated recipes. I’m not sure what drew me to the lentil soup. Maybe it sounded simple. Maybe I just happened to have bought lentils. I don’t think the recipe actually called for orange lentils, but that’s what I used. I’ve never been good at following recipes to the word, in any case. 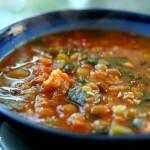 Since then, I’ve learned that lentil soup is pretty easy to make, with or without a recipe. So are many other things. Particularly things involving vegetables or legumes. In fact, I generally can’t be bothered to look up a recipe, since at this point I pretty much know what I need to put into the pot in order to create the result I desire. So why do I publish recipes? Well, many people like them. The accompanying photos are inspirational. And somewhere, kitchen beginners like the one I was 10 years ago may just use them to learn to cook. This recipe makes an awful lot of soup — between 8 and 16 servings, depending how thick you like your soup (I like mine watery). The small amount of whole-grain rice means that it contains complete proteins, and the rice also adds a pleasant chewiness, especially if you water down the soup. This volume of water will give you a fine soup the day you make it, but once it cools, it will thicken considerably. On the following days, I usually dilute it by at least half, and add extra salt. On another note: One of my favorite foods to eat the afternoon before Yom Kippur begins is majadera. A small amount leaves you full for hours. I bet this soup would be very filling, too, if you don’t dilute it. Prep time: 10 minutes. Cook time: 30 minutes to 1 hour. Chop the carrots and onions, and put into a large pot or pressure cooker on a medium flame. Stir as the vegetables begin to brown (you really don’t need oil at this point). Meanwhile, rinse the lentils and rice (always a good habit — mine tend to contain dirt). Add to the pot. Cover the pot, and let simmer for an hour. (You might need to add extra water midway; I use a pressure cooker, which prevents any water from boiling off.) If you’re using a pressure cooker, then seal it, and let it simmer pressurized on a low flame for 20 minutes. 11 Responses to "Orange lentil-tomato soup with complete protein"
I love my pressure cooker, but have never done a lentil soup in it. Thanks for the recipe, I will definitely be giving this a shot soon. 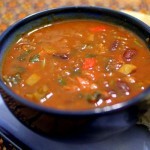 Wow, and as far as I’m concerned, my pressure cooker is made for bean soups! What are you making in yours? 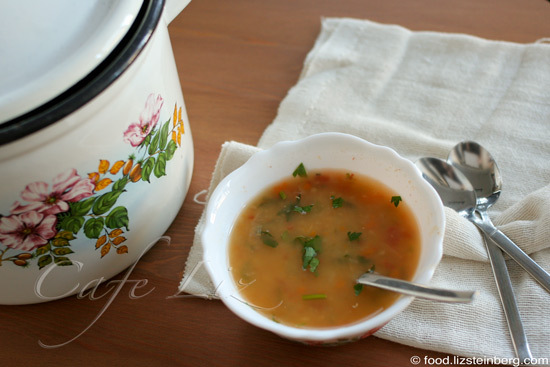 This soup looks so homey and comforting! I don’t own a pressure cooker but have long considered buying one. I am in love with my pressure cooker. One of my best kitchen purchases ever. i’m a new reader. i made this soup last Friday to start our erev Shabbat/Yom Kippur meal. So delicious! “Most everyone went for seconds! I’ll be making this soup many more times. I am so excited I found your site as so many of the recipes sound so wonderful. Reading of you going through all the markets makes me want to move to eretz yisrael. one more thing … i don’t have a pressure cooker (yet) worked great in a soup pot. I went to bed last night thinking that I wanted to make lentil soup in the morning – and just started to browse through my favorite food blogs for inspiration. How serendipitous! I’m going to start making it right now! 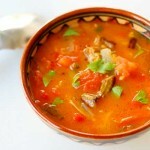 Hope you are having a lovely holiday – a.
I agree with you about recipes, especially soups! I use whatever I have. And the pressure cooker is also my favorite pot. Thanks Ben! Glad to hear it.